Power Player. The Pattern 1. Make a List. 2. Contact & Invite 3. STP (Tuesday TEAM Cast ) 4. Follow Through 5. Rotate & Teach Learn / Do / Master These. 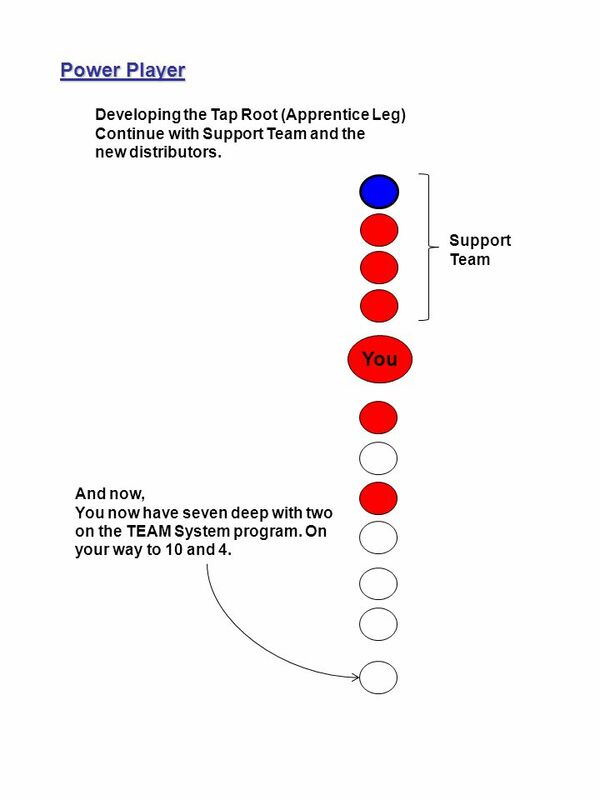 4 You Developing the Tap Root (Apprentice Leg) Continue with Support Team and the new distributors. Support Team Power Player Skill! Immediately set up a “Business Launch” at the newest distributors house. 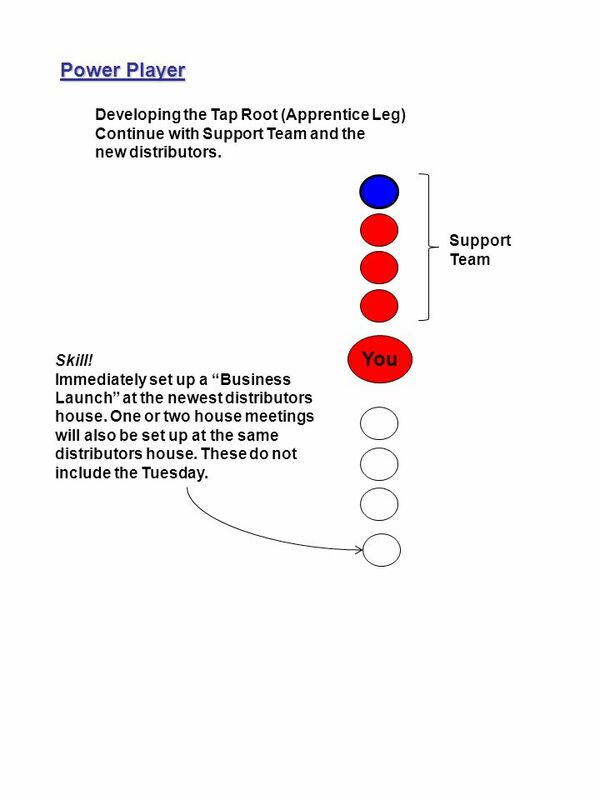 One or two house meetings will also be set up at the same distributors house. These do not include the Tuesday. 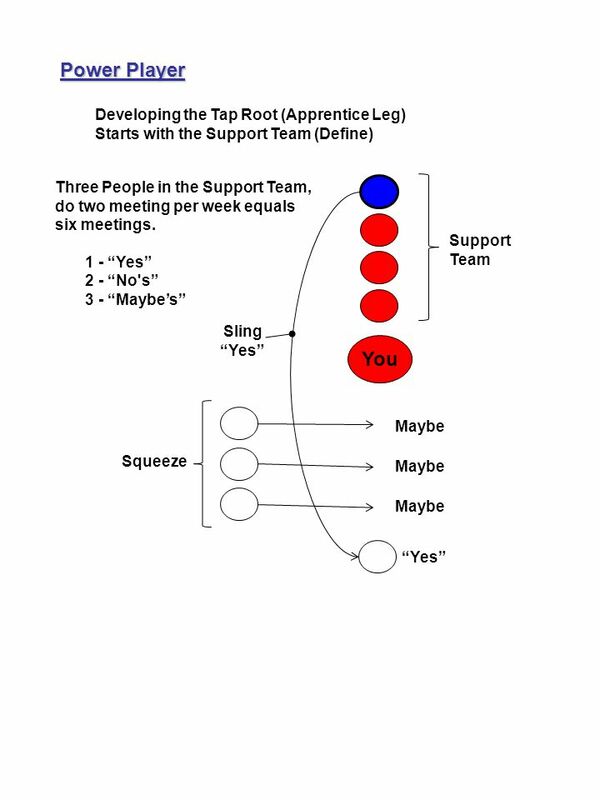 6 You Support Team Developing the Tap Root (Apprentice Leg) Continue with Support Team and the new distributors. 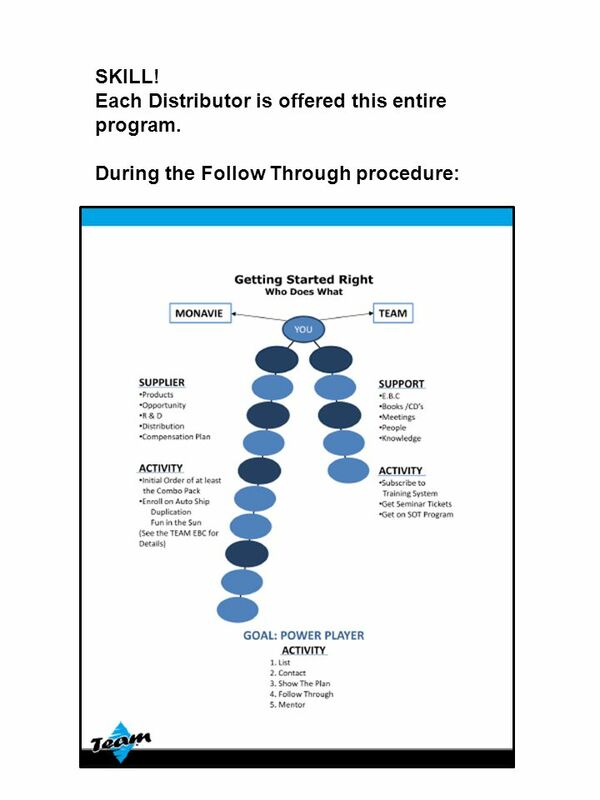 Power Player And now, You now have seven deep with two on the TEAM System program. On your way to 10 and 4. 7 You 1 2 3 4 5 6 7 8 9 10 The Apprentice Team is now set for Power Player. 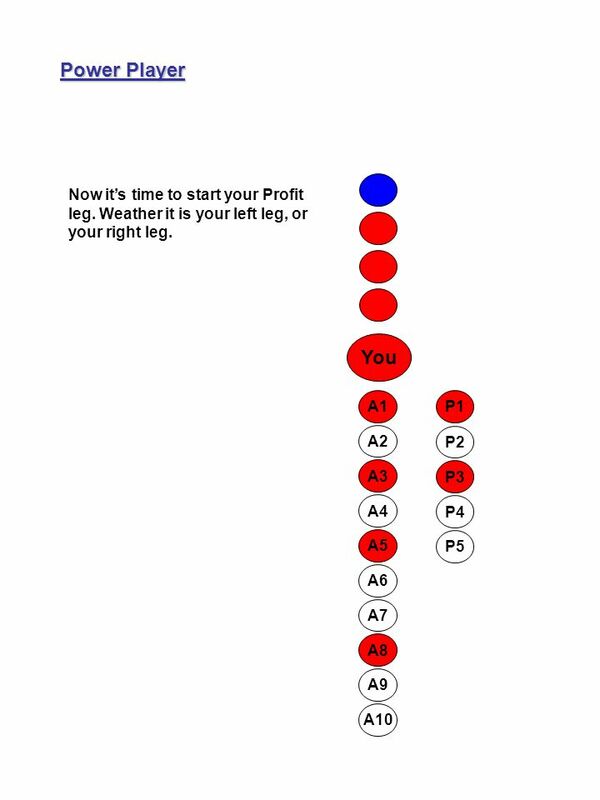 Now it is time to begin you Profit Leg. 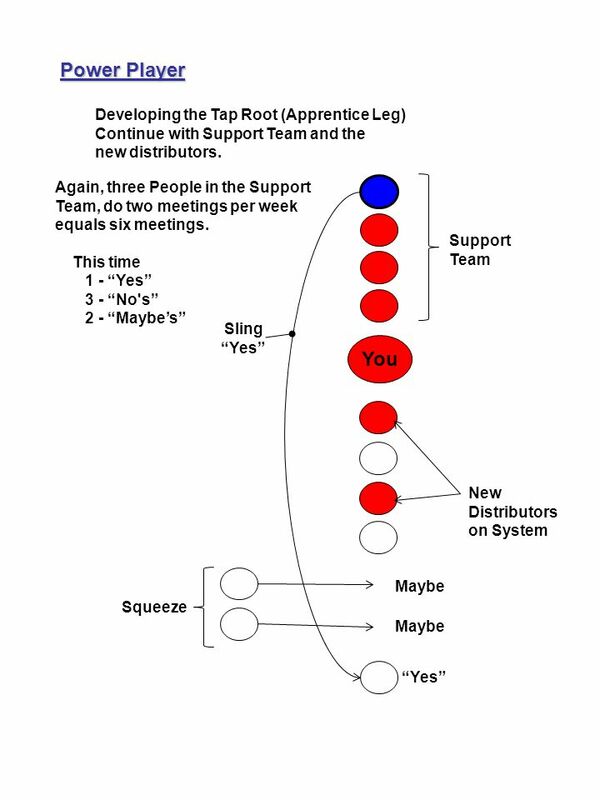 Developing the Tap Root (Apprentice Leg) Continue with Support Team and the new distributors. Power Player SKILL! Continue to do Business Launches at the bottom of the leg and setting up house meetings, and have everyone come to the Tuesday. 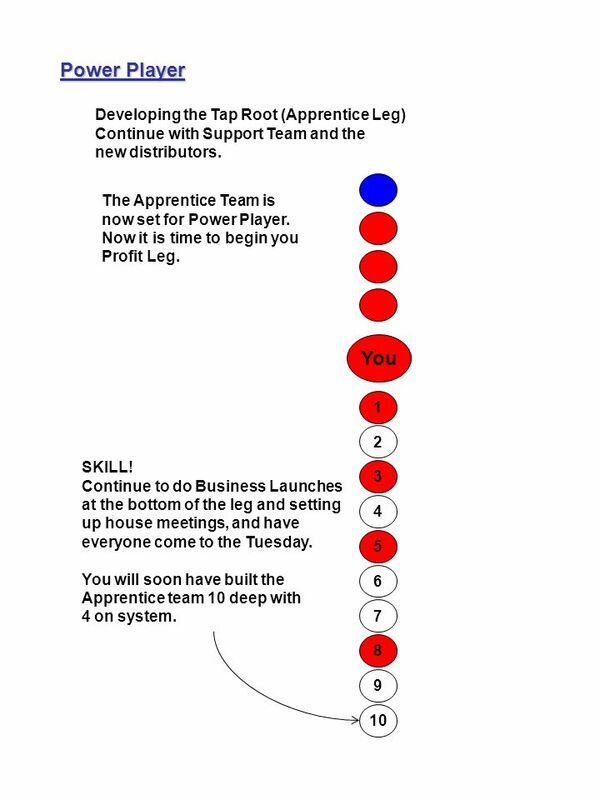 You will soon have built the Apprentice team 10 deep with 4 on system. 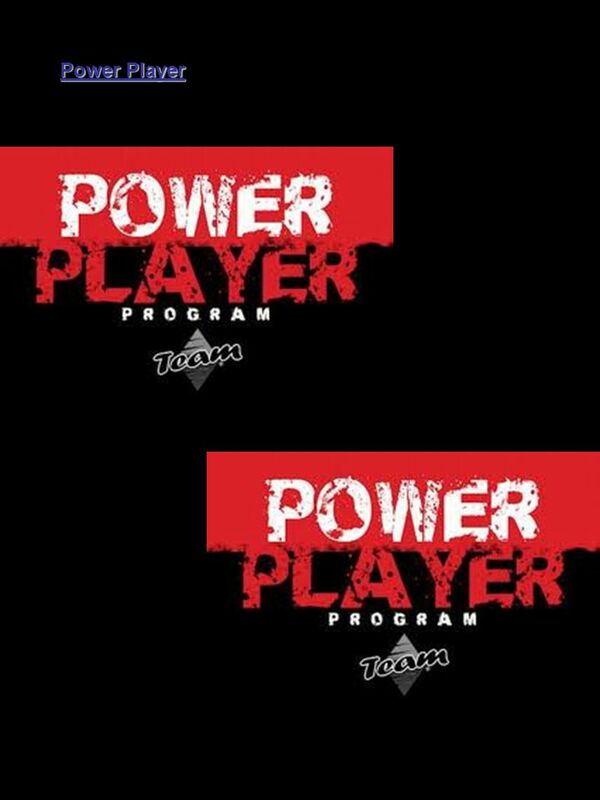 10 Power Player You P2 P3 P4 P5 A1 A2 A3 A4 A5 A6 A7 A8 A9 A10 P1 Now it’s time to start your Profit leg. 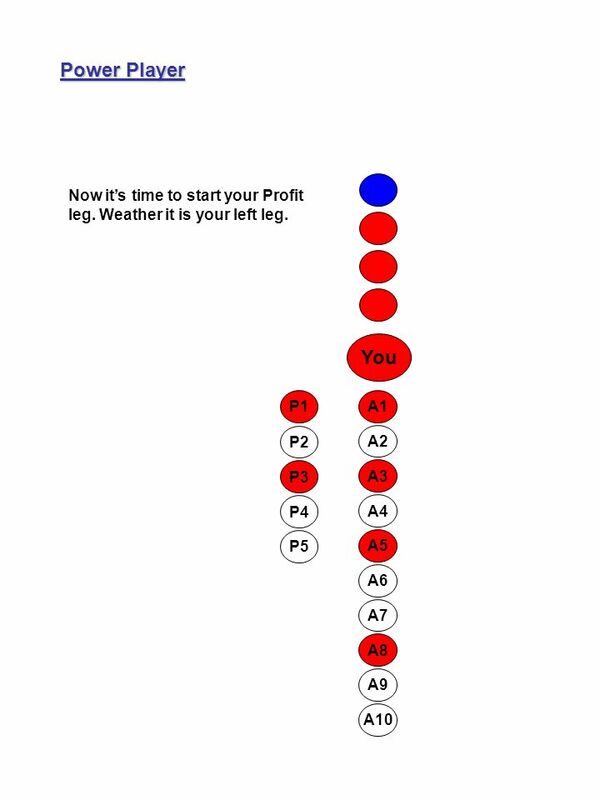 Weather it is your left leg, or your right leg. 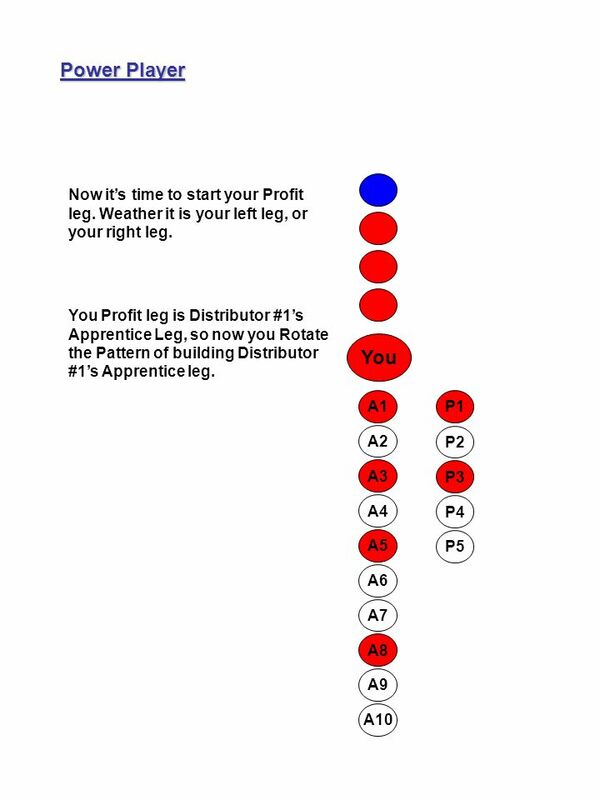 You Profit leg is Distributor #1’s Apprentice Leg, so now you Rotate the Pattern of building Distributor #1’s Apprentice leg. 16 Woodward – Brady Promotion for early September! 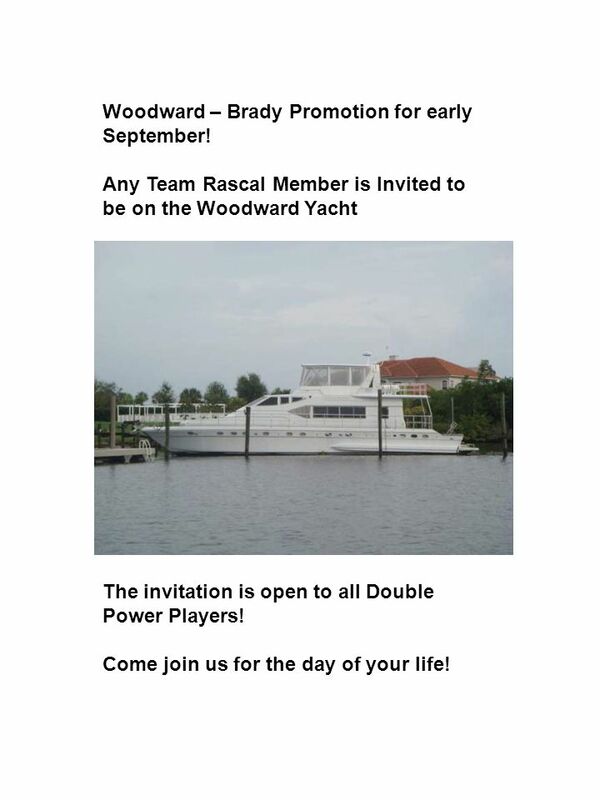 Any Team Rascal Member is Invited to be on the Woodward Yacht The invitation is open to all Double Power Players! Come join us for the day of your life! 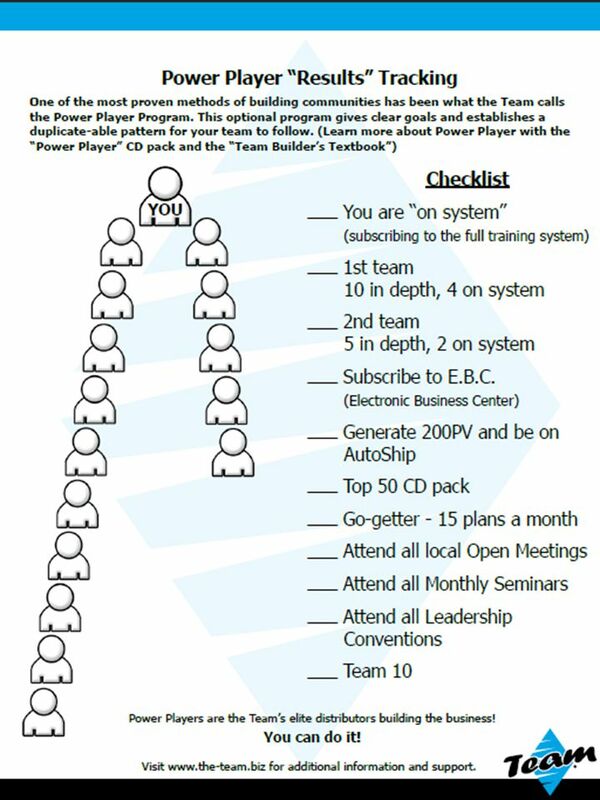 Download ppt "Power Player. The Pattern 1. Make a List. 2. Contact & Invite 3. STP (Tuesday TEAM Cast ) 4. Follow Through 5. Rotate & Teach Learn / Do / Master These." How to Build a Nikken Empire!. 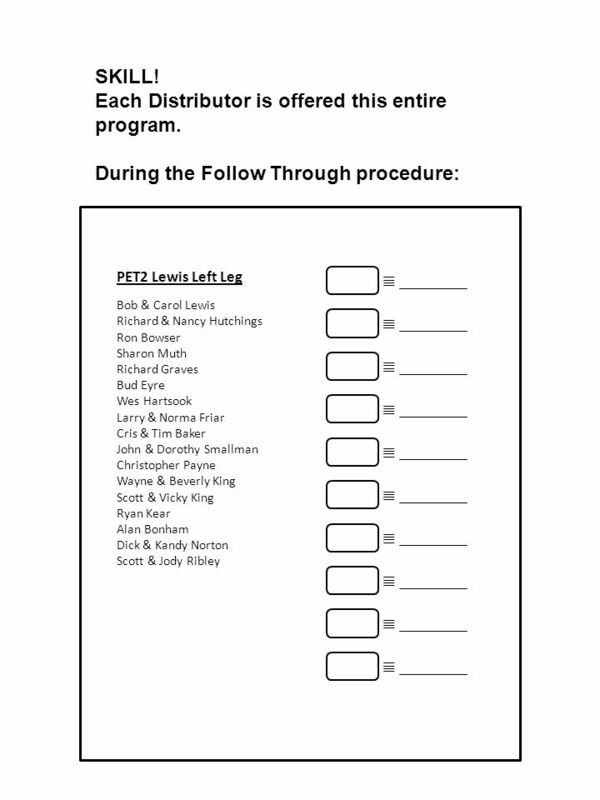 (The job is just beginning when Ron is sponsored. Ron will need your help. Teach him how we work! Hes going to run for. WHAT IS …. DOING? WHAT DOES..DO? Whats Peter doing? Hes playing football. What does Peter do? Hes an accountant. Whats Jane doing? Shes answering the telephone. Note: Please view this presentation as a slideshow as there are animated slides throughout. Click the mouse to advance. 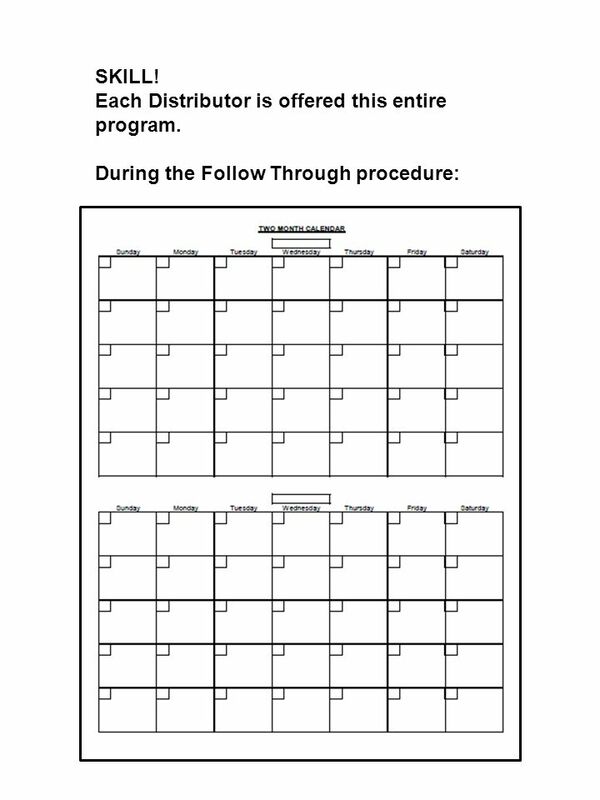 Beginning Vital Behaviors 1. Are you doing these Vital Behaviors? 2. Are you doing these Vital Behaviors enough? 3. Have you Mastered the skills to do. What Am I? At look at everyday items from America in the 1800’s. Shifting bark which Alan Colley (Council Allotment Officer) kindly allowed us to use to restore old paths and lay some new ones Issue 9 February 2014 Hope. Pro 3 in 30 days or less Plan. 1 Administrative Items Questions / Assistance –JoAnn Funk, Omen –Heather McCallum-Bayliss, ARDA SETA Demo’s –Questions concerning your Demo set-up? See. Weeks after Joining Me and Terry Shorrock - Just after Joining. Jesus Is Coming Again 1. Marvelous message we bring, Glorious carol we sing, Wonderful word of the King, Jesus is coming again! Coming again, Coming. Photos by Bruce DeGraw, Mary Kennedy, and Beverly Plummer. The O’Briens Janice Devin The Kundrats Rhonda Bob. Launching New Independent Business Owners (IBOs) Name Position. 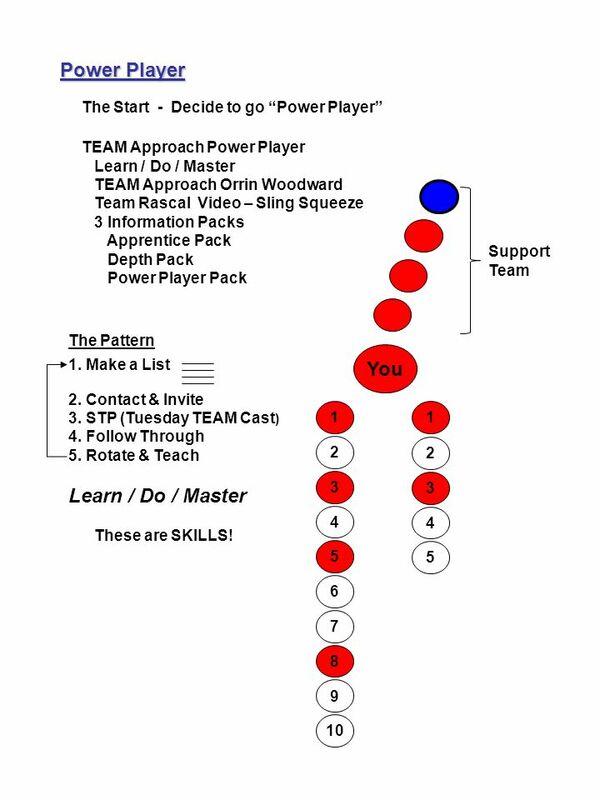 The Hedgehog concept from the book Power Player You The TEAM Approach to this Industry Working as a TEAM L1 L2 Qualifications for Power Player 1. On System.